Can Mice Eat Dry Corn? Adopting a mouse into the house brings with it the dilemma of what to feed her. A wild mouse eats just about anything she can gnaw her way into, as anyone whose pantry has been invaded by a wild mouse or two can attest to. Looking over the commercially prepared mouse food at the pet supply store, maybe you've wondered whether the mouse mixes containing dry corn are safe for your mousie. Dried corn is a common ingredient in most commercial rodent food mixes including those for mice, hamsters and rats. That's because grains are a staple in the diets of these small rodents. Dry corn along with oats, nuts and seeds are all safe to feed your mouse, and they often are found in prepared mouse food. Even if dry corn is your mouse's most favorite food on the planet, it shouldn't make up the majority of her diet. Your mouse needs balanced nutrition. So in addition to corn make sure she gets grains including rice and pasta, vegetables, and an occasional source of protein such as scrambled eggs or even a live cricket now and then. 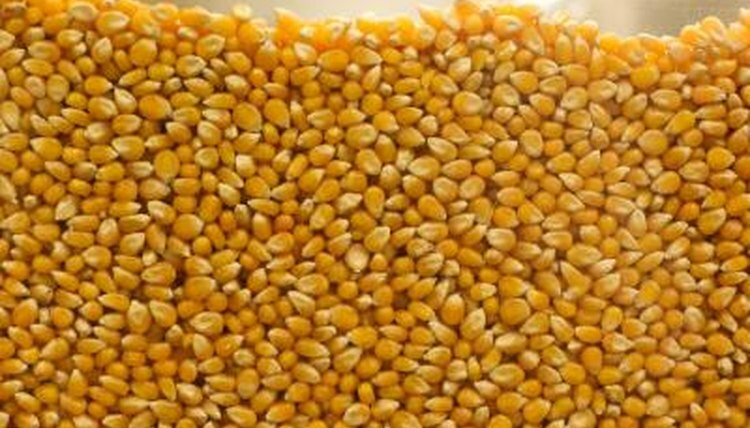 Although dry corn is generally safe to feed your mouse, it can cause health problems. Some animals, mice included, develop an allergy to corn. So if you notice your little rodent has dry flaky skin and is scratching, remove the corn from her diet and see whether her skin clears up. Also, feeding your mouse corn that was treated with chemicals -- specifically those intended to kill rodents -- is dangerous. Always make sure the dry corn you feed your little one is clean and free from toxic materials. If you'd like to throw together a special blend of mouse mix for your furry little friend, you can find items for your recipe in the bulk section of the grocery or health food store, or even at farmers' feed and seed shops. Mix together equal amounts of dry corn, oats, wheat grain, and millet. You can add in a small amount of sunflower seeds, but use less of them because they're high in fat. And put in some dry cat or dog food, a little less than the amount of sunflower seeds. The pet food adds vitamins, minerals and protein to your homemade mouse mix. What Do Mice Usually Eat? Are Mice Really Attracted to Cheese?